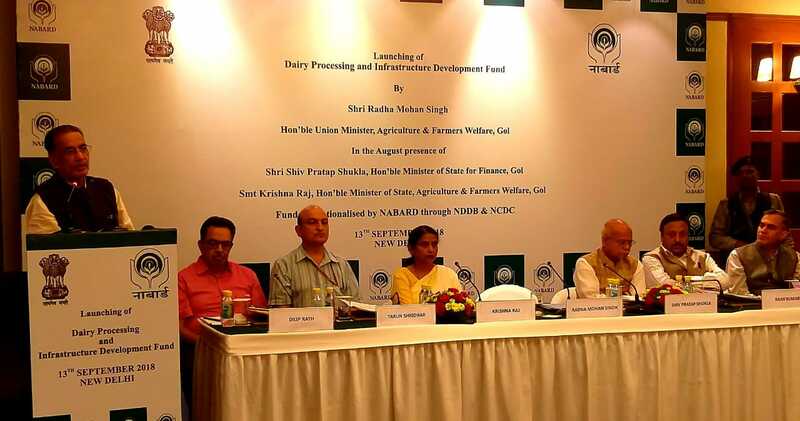 In what can be termed as a major intervention in the dairy sector after the white revolution of the 70s, GoI has set up a Dairy Processing and Infrastructure Development Fund (DIDF) in National Bank for Agriculture and Rural Development (NABARD) with a corpus of Rs 8,004 crore to support modernisation of the dairy sector in the country. This initiative is expected to achieve an investment of Rs 10,000 crore in the dairy sector in three years, viz. 2017-18 to 2019-20. 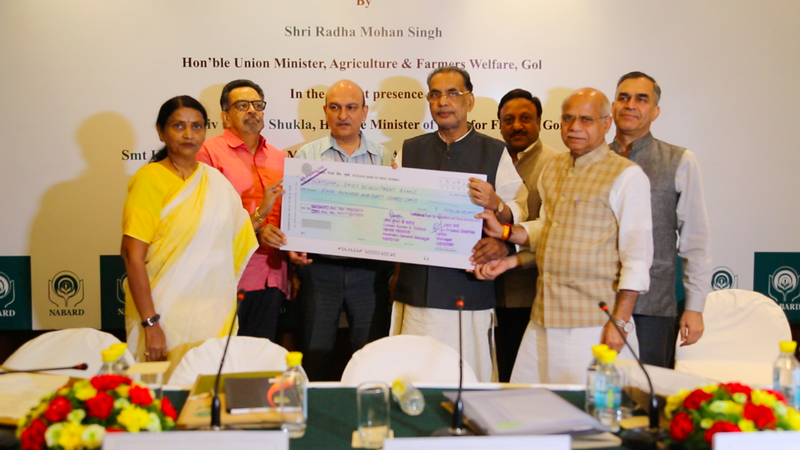 Shri Radha Mohan Singh, Union Minister for Agriculture and Farmers Welfare launched operationalization of the Fund today by handing over a cheque of Rs 440 crore as the first instalment to National Dairy Development Board (NDDB) Chairman Shri Dilip Rath at an event held in New Delhi. The fund would be distributed to six different projects which include Dakshina Kannada Milk Union (Udupi), Kolar-Chikhballarpur Milk Union (Kolar), Mysore Milk Union (Mysore), Karnataka Milk Federation (Ramnagar), Karanataka Milk Union (Channarayapatna) and Ropar Milk Union (Ropar). NABARD has so far sanctioned Rs 843.81 crore under DIDF for 15 projects with an investment of Rs 1148.58 crore in Karnataka, Punjab and Haryana States. It is expected that sanction shall reach Rs 3800 crore by the end of the current financial year. The event was graced by Shri Shiv Pratap Shukla, Minister of State for Finance, Smt Krishna Raj, MoS for Agriculture, Shri Rajiv Kumar, Secretary, DFS and Shri Tarun Shridhar, Secretary, DADF of the Union Government. Maintaining that the dairy activity has been growing fast, Agriculture Minister said that per capita milk availability has gone substantially up to 377 gram per day. He reiterated that only more value addition in dairy sector will ensure more income to the dairy farmers. DIDF will help about 95 lakh dairy farmers across 50000 villages. “Gaon, Garib and Kisan are the focus of the present Government. In order to ensure doubling of income of farmers, animal husbandry plays an important role and there the DDIF will be crucial” he said. Shri Shiv Pratap Shukla, Minister of State for Finance said that cooperative sector is the pride of India. “Cooperatives are linked to the people, especially the farmers and hence strengthening cooperatives will take India forward” he told. He also said that like the success in Jan Dhan Yojana which enabled 32.50 crore bank accounts for poor people, DIDF will also be a huge success. Smt Krishna Raj, Minister of State for Agriculture said women in the villages are engaged in dairy activities. By giving optimum prices for the milk, DIDF will help them to increase income. Quoting the latest NABARD All India Rural Financial Inclusion Survey (NAFIS), Shri Harsh Kumar Bhanwala, Chairman, NABARD said that 51 percent of agricultural households own milch animals. “Milk production has been growing around 6.5 percent each year and we need create infrastructure to handle the production and process the same” Bhanwala said. He opined that looking at huge investment requirement of dairy sector, there is a case for launching DIDF -2.